In the academic year 2008/09 there were a total of 1,046 Diploma learners in the West Midlands. This represents 9.2% of all Diploma learners in England. 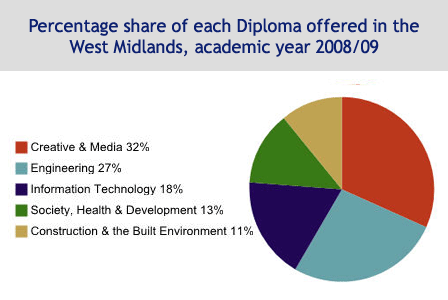 23% of all Diplomas in the West Midlands were offered by schools and colleges in Wolverhampton and 20% in Birmingham. Of the 208 learners in Birmingham, the majority (68%) have chosen Creative & Media, a course covering disciplines such as TV, computer games and interactive media. The other Diplomas offered to schools and colleges in Birmingham were Construction & the Built Environment (6%) and Engineering (26%). The largest number of learners is in Wolverhampton: 243 students, which accounts for 23% of all Diploma learners in the West Midlands. No Diplomas have yet been offered for the academic year 2008/09 in more than a third of the sub-regions (Warwickshire, Herefordshire, Telford & Wrekin, Staffordshire, Sandwell) but the situation may change for the next academic year 2009/10. We’ll provide an update as soon as the statistics for the present academic year become available. In some areas of the region other subjects were more popular. In Stoke-on-Trent the majority (32%) have chosen Engineering, closely followed by Information Technology and Construction & the Built Environment. In Solihull all 58 Diploma learners have chosen Information Technology. In Coventry everyone has enrolled for an Engineering Diploma. At a regional level Creative & Media is still the favourite option (32%) followed by Engineering (27%). At England’s level Creative & Media is again, by far, the most popular Diploma (68%) followed by Engineering with 41%. Another five Diplomas were introduced for the academic year 2009/10 and there will be 17 by 2013. It will be interesting to see whether any of these can change Creative & Media’s top position. Severn Trent Water mentioned as one provider of the work-based learning aspect of the diploma.